It is true that deep down, all of us like to be remembered and made to feel special on that “one-day of the year”. After all, one has to offset the feeling of adding one more year to the ever-growing pile of the age-number! For some, it is all about how many people call us, send us cards, or more publicly, wish us on social networking sites like Facebook. However, there is rarely the person who is not delighted and touched by a thoughtful gift, delivered on the day. The gift giving gamut ranges from the super expensive (think Cartier, Prada) to the humble (flowers, handmade gifts). However, it is very true that the sentiments are what counts and even a simple bouquet or roses, accompanied with a sincere greeting can trump even the most expensive designer watch, given thoughtlessly. 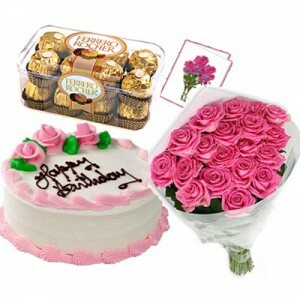 Gujarat Gifts offers services to send Birthday Gifts to Indiaonline with gifts starting at less than Rs. 300 (inclusive of delivery). To take care of the sentiments aspect, all Birthday Gifts are accompanied with a Free Greeting Card, which is handwritten with the message of the gift giver. Thoughtful hampers of scrumptious cakes, chocolates and other delicacies are on offer to minimize the confusion for birthday gift givers, while meeting all budgets. Shipping is offered all over India, so one can comfortably send birthday Gifts to Indiafrom Mumbai to Nagpur, Delhi to Kolkatta! Logistics arrangements honed over 14 years of operations ensure that Birthday Gifts can be delivered even on the same day, for major metros. So, all you need to do now is to jog your memory for that elusive birthday date, and place your order now, and team Gujarat Gifts will do the rest. Happy Gifting!